Wow never even knew that was possible! So Thursday evening I met with a fellow blogger for dinner and drinks. We had met already maybe two months ago, had drinks in the city with some other bloggers. So Thursday met at an Italian salumeria. The food was phenomenal. We ordered a cheese and meat platter, rigatoni bolagnese and eggplant parmesan. When the cheese and meat came, we realized that should have been the only thing we ordered. BIG PLATTER. 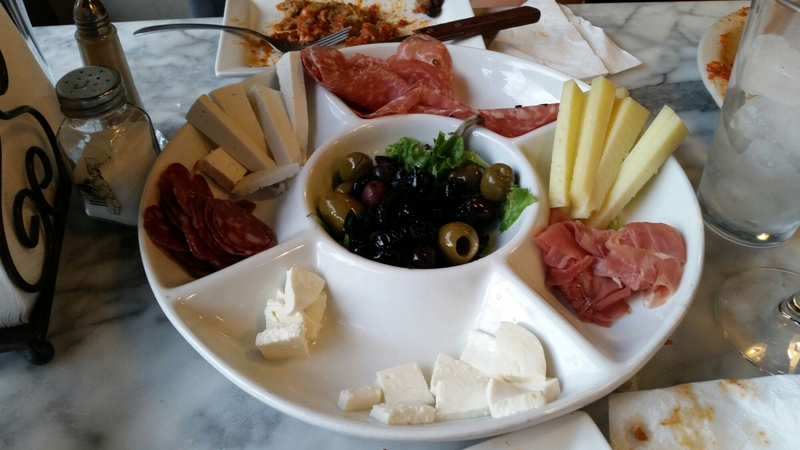 Clockwise from the top: Soppresatta, Machego, Prosciutto, Mozzarella, Cacciatore, and Ricotta Salata. And believe you me, everything was DELICIOUS. And… SALTY. I mean if that wasn’t enough, there were olives in the center. We put a little dent in it but had other food too. Couldn’t finished any course. Sinfully good. Just too much. I took the leftovers. Very fun evening. Lots of laughing, blog discussion and general banter.